I feel like I am being spoilt for choice with great thrillers lately and, although I have a huge pile of books to read, I bought this one from Amazon after seeing lots of bloggers getting excited about the imminent release of the next book in the series. I’ve always been intrigued by cold cases, probably because I never give up on things and don’t like to be beaten, so I thought it was a gripping and completely original storyline. DCI Matilda Darke is an extraordinary character – at first she appears vulnerable after returning to work following a leave of absence. It isn’t long before we glimpse the real Matilda Darke though, and realise just how good she is at her job and wonder what happened to make her take time off work. It almost felt like there had been a book before this one as the author teases us about previous events, but we are gradually allowed glimpses into Matilda’s past so we can gather little pieces of the puzzle as we go along. To ease Matilda back into work, and because DCI Hales is covering her post and isn’t going to give it up without a fight, she is given a cold case to work on. A husband and wife were murdered 20 years ago with their 11 year old son in the house. The house is about to get demolished so the case, which was never solved, is back in the news. Matilda meets up with Jonathan Harkness, who was the 11 year old boy who may or may not have seen his parents’ murder all those years ago. Jonathan was so traumatized that he lost the ability to speak for a time after the murders and he has never been able to help the police to piece together events from that fateful night. What does Jonathan know and what happened to his brother who wasn’t in the house at the time of the murders? Jonathan is a bit of an odd bod. He is a bit of a loner and seems to only have one friend – an old lady, Maun, who lives in his apartment block. As the story unfolds, it would appear that Jonathan and Maun have more in common than they thought, as Maun’s husband died in mysterious circumstances. 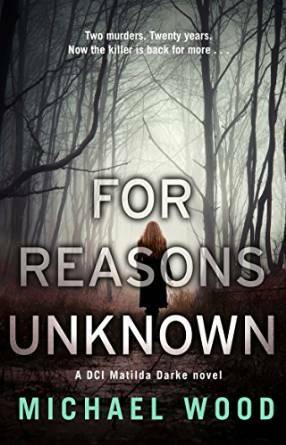 When an unidentified body turns up that DCI Hales is in charge of investigating, he is put in direct competition with Matilda as the identity of the victim links to the Harkness cold case. The competition was so fierce that I thought they might come to blows and Matilda really shows what she is made of as Hales starts to fall apart. I loved all the dangling threads of this story. There was so much going on with current events and shady pasts that it really gave my brain a workout. Even though I had my suspicions as to what had happened, there were still plenty of shocks and surprises in store. For Reasons Unknown is an action packed page-turner that had me on the edge of my seat throughout. I have no doubt that this is going to be a stunning series and a firm favourite of both crime and thriller lovers. Darke by name and dark by nature – read it or regret it.